Zappos is considered a leader when it comes to customer experience, but it hasn’t always been that way. 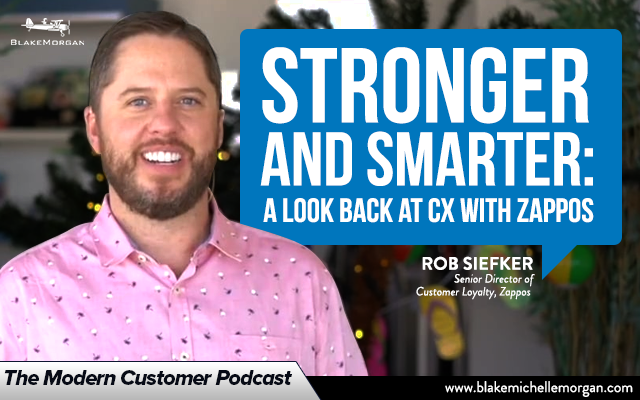 When Rob Siefker, now the Senior Director of Customer Loyalty, started representing the company at conferences years ago, he estimates only 10% of people had heard of Zappos. Now that number is around 99%, and the company has become a model of how to create a customer-obsessed culture. However, the road to Zappos’ success wasn’t without hiccups. Zappos has been an evolving company from the start. When Rob started in 2004, he was working as a temp in the call center on a job that was only expected to last a few days. That didn’t end up being the case, and he has grown with the company over the last 14 years. As Zappos has grown, one thing that has stayed the same has been the company’s customer-obsessed mindset. Although customer trends, expectations, and technology have changed, Zappos has been able to stay true to its brand and respond to a changing environment. One of the biggest changes for Zappos occurred when the company shifted to a Holacracy model in 2013. Instead of using the traditional top-down organizational system, Zappos wanted to encourage innovation and empower employees by flattening the structure and distributing power. Zappos is now a leader in Holacracy, and it has been a great fit for the company, but it there were challenges along the way. There were a lot of unknowns with the initial transition, especially because no company of Zappos’ size had ever tried Holacracy before. One of the things Rob said the company didn’t anticipate was how to process the natural tensions that come with change. The new system was a bit disorienting at first, simply because it was something employees had never experienced before. Some of the early growing pains could have perhaps been mitigated if leaders had better anticipated the challenges and taught employees how to use the new system to instigate change. Rob suggests that other companies that move to Holacracy or make any sort of big structural change should recognize that people will likely have a hard time with a significant change and will need time to adjust. Rob recommends involving employees from the beginning of the process and answering their questions right away so they can see how the change will affect them before it actually takes place. Zappos considered its employees when moving to Holacracy and trained them on the new system, but it also wanted to move quickly, and there were areas where it could have been better to slow down and make sure everyone had a firm understanding of the new principles. However, the challenges of moving to a new system only solidified Zappos’ customer-first culture, and the company came out stronger. Zappos Insights is a consulting arm where Rob and other employees mentor other customer service companies on running contact centers and putting customers first. The key thing for these companies to remember is that every business is different and there isn’t one single playbook for success. Zappos has grown and evolved over the last decade, and it will continue to evolve as demands and technology change. However, Rob says that the focus always has been and always will be on building an emotional connection between customers and the brand. The company will continue to elevate its customer experience in new ways, including its Zappos Adaptive program that curates products for people who have disabilities or limitations that makes it harder for them to put on clothes and shoes. Zappos aims to provide better service to an underrepresented customer group and to all customers. Although it hasn’t always been a smooth road, Zappos’ ability to focus on customers and empower employees has allowed the company to take risks and come out stronger and smarter than ever before. Although every business is different, every company can learn from Zappos’ customer-focused culture.